It’s been quite a while since I posted but there’s finally some time to sit down and relax. It’s been my busiest season yet doing lots of teaching for the military, taking actor Josh Brolin out for training in the desert, finishing up my fourth book The Modern Hunter-Gatherer while working on a new Hogan at our basecamp. Whew, I need to go on a Walkabout! After returning from my latest trip, I found a nice package in the mail from Doug Ritter. In case you don’t know Doug and his company Equipped To Survive, he runs the most comprehensive survival and outdoor gear testing company you will find. Many refer to his company as the Consumer Reports for the survival industry and I agree. If there’s a new GPS, Personal Location Beacon (PLB), firestarter, or first-aid kit, you will get an honest review from Doug as to whether it works, is worth the money, or a waste of money. I had the good fortune of heading out on a desert survival course with Doug and Ethan Becker a few years ago to test gear and what impressed me the most about Doug is that he goes out in the elements (in this case 112 degree heat) to actually test his gear rather than writing about it solely from the comfort of a keyboard as so many reviewers do. If you haven’t seen the man’s site, do so- http://www.equipped.org and you will be outfitting your survival kit with quality gear. OK, so what was in the package? The first contained the eGear Pico Lite designed by Doug. 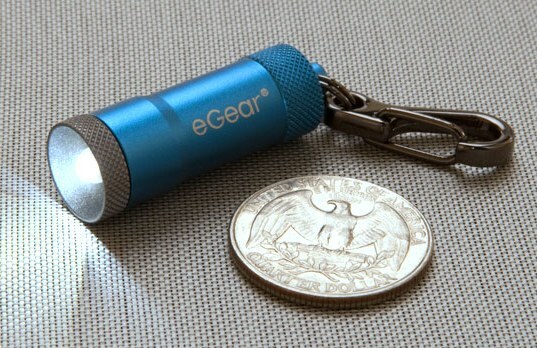 This is a power-packing LED flashlight in a pinky-sized package. Now, most of us have had the fragile keychain lights and mini-pulsar lights that crack the first time they fall on the pavement. The Pico Lite has a durable casing that can take a beating and is powered by four replaceable alkaline button-cell batteries. This is a flashlight that has the output of a much larger LED. In fact, the Pico kicked out more light than my Inova light! But what I like most is that this is a piece of gear that WILL take punishment and that is what I need when out under extreme conditions- reliability. These retail for $12.95 or a blister pack (of 5) for $9.95. Well worth it! The other item I received for review was Doug’s latest survival knife, the RSK Mk5 which in his words, ” is compact and light enough to fit in almost any small personal survival kit or stash-away location, yet robust enough that it’s a knife you can bet your life on™. The blade is made by Columbia River Knife & Tool. I will take this blade out on an upcoming walkabout this month to run it through some tests but so far it is excellent at producing fine shavings for firestarting and did a nice job of cleaning a trout my son and I caught fishing this past week. This is a knife I can see including in my pocket survival kit. The blade is 1.75″ long and the knife has an overall length of 3.81.” Cost is $26.99. I carry two blades on me at all times in the backcountry, and will now add this one for the smaller jobs in the bush. Again, when you are looking at getting survival gear, obtain quality items that will get you through the long, cold night when you’re stranded and life hangs by a thread. In survival, you do get what you pay for, both in skills training and in the gear you carry. Ritter’s gear is highly recommended by our school for the forethought and durability put into it! Stay safe and enjoy the wilds! Our 5-week program starts up here shortly and after that it’s more fun with the fine warriors from Ft. Bragg so the next blog might be a while.